Shane Crawford was an amazing talent of the Australian Football League and a crowd favourite both on and off the field. 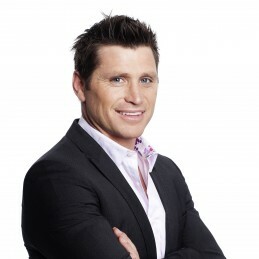 Following his 16-year professional career with the Hawthorn Football Club, Shane transitioned seamlessly from footballer to highly marketable media personality. Shane has the ability to engage and entertain a wide variety of audiences. His long time association with Channel Nine has seen him as a regular panel member of The Footy Show, The Sunday Footy Show and more recently Postcards. His prominent media presence was highlighted by his charity events, awareness raising and fundraising for Breast Cancer Network Australia. In 2010 That’s What I’m Walkin About saw him spend 11 days walking from Adelaide to Melbourne, drawing huge crowds and media attention while raising $500,000 in the process. He later repeated this effort with his 3700 kilometre bike ride, Tour De Crawf, from Melbourne to Perth, raising over $1.5 million. Born in Mount Barker, South Australia and raised my his mother in Finley, New South Wales, he crafted his game at Assumption College before becoming one of the AFL’s best players. A fitness fanatic and running machine, he was highly skilled, durable and courageous. Shane was named as Hawthorn’s captain in 1999, immediately taking them to the pre-season premiership, and winning a string of awards including the league’s most coveted award; the Brownlow Medal. Shane was four times a club best and fairest and All-Australian. His 305th and final game saw him win a premiership medallion with his beloved Hawks. Following his retirement in 2008, he released an autobiography; That’s What I’m Talkin About. Through his columns in the Herald Sun newspaper, Shane has shared the inner thoughts of a champion. Shane’s other passion, horse racing, has seen him cover Autumn and Spring carnivals for the Herald Sun. Shane was made the face of Focus on Furniture and is part of promotions for Crown’s WestEnd precinct and Country Racing Victoria. The AFL has also recognised Shane’s marketability by making him the Auskick Ambassador. Shane lives in Melbourne with partner Olivia and sons Charlie, Benjamin and twins Harry and Jack.